Back in the early days of Custom Restyling every body type was considered good Custom material. As we can see with this wonderfully restyled 1937-38 Ford Sedan in front of the Barris’s Custom Shop. Special thanks to Justin Kudolla. 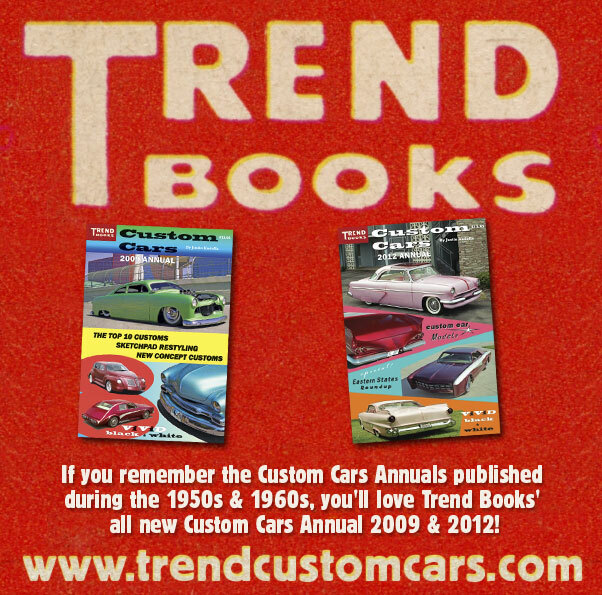 I have always been very much intrigued by the history of the so called early style Custom Cars. The Custom built in the 1930’s and the 1940’s. Very original and inspiring restyled cars built by customizers who were creating and defining the styles that we still study and use today. Cars that were customized before the major magazines started to publish Custom Cars and influenced builders and car owners. In an era that basically every car body style could be used for restyling. In these early days you saw not just coupes or convertibles being restyled. Also two and four door sedans would be used, and not only as mild customs. Later on in the 1950’s most of the cars that would be restyled into a full custom would be based on the more “desirable” coupes and convertible. And the sedans would perhaps be restyled with minimal modifications, as a mild custom. Of course there are a few exceptions to that. I have always been a fan of restyling other body styles than the coupes an convertibles. I’m not quite sure why, but I just love the looks of sedan bodies. 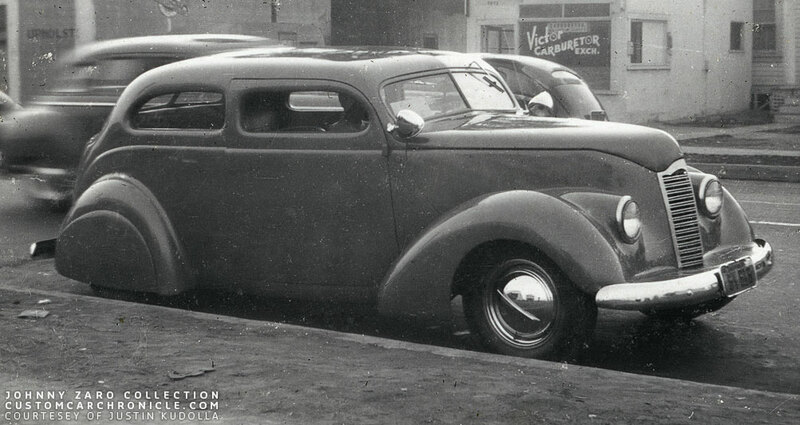 So when I first saw a photo of this fully Customized 1937-38 Ford two-door sedan I was very thrilled. The fact that it was photographed in front of the Compton Ave. Barris’s Customs shop made it even better. 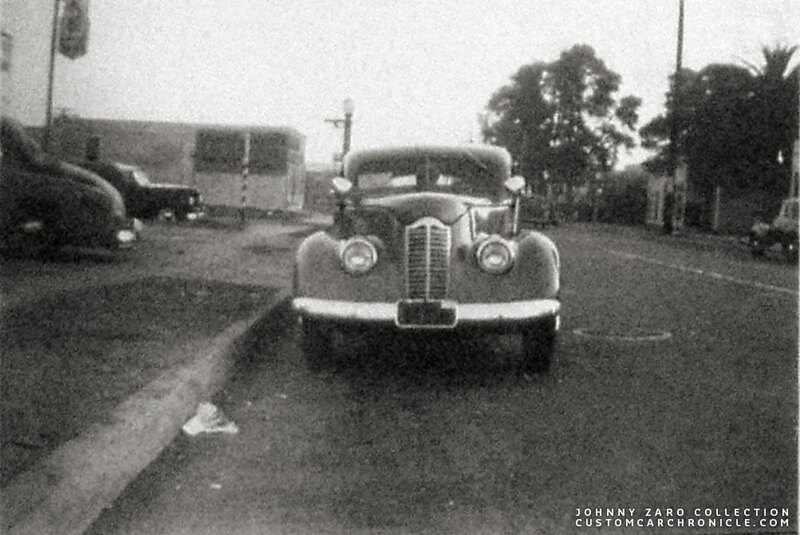 The photo of the 1937-38 Ford scanned from the Johnny Zaro photo album. 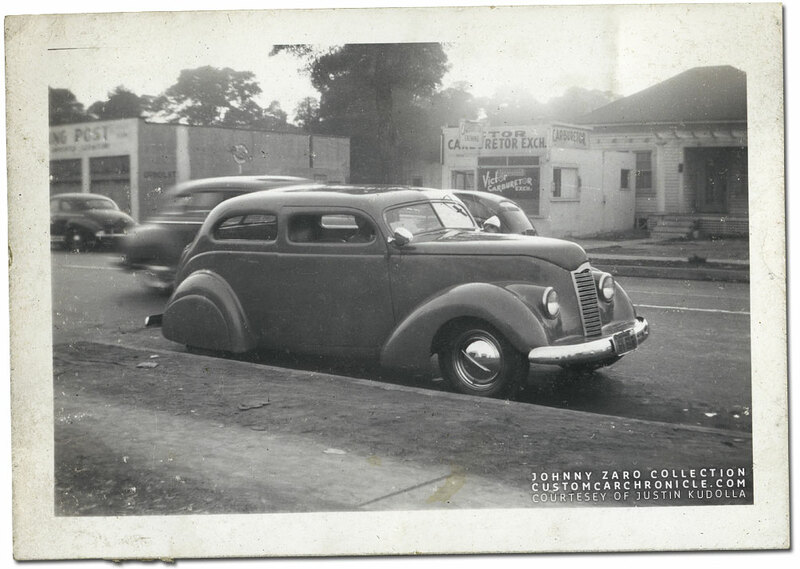 The photo was most likely taken between 1946 and 1948 on Compton Avenue, right in front of the Barris’s Customs Shop. If the camera would turn to the right we would see the Rex Liquor store. If the camera would turn left we would see the Barris shop. So far I have only seen two photos of this Custom Sedan, and both photos come from the Amazing Johnny Zaro Collection. I first saw them when my good friend Wolf shared some photos he had taken of the photo album Kurt McCormick had copied from Johnny Zaro. Later Justin Kudolla shared a better scan he made from the Zaro Collection with the CCC. This new scan was really fantastic and showed us how well done this car is. Sadly these two photos of this car is the only thing we have or know about the car. Nobody we have asked about this car so far was able to shed some light on who the owner was, or even who build it. Since the photos were taken in front of the Barris’s Customs shop we assume this is a Barris created Custom. The whole style and the way the car is customized does fit in with everything the Barris’s did back in the mid to late 1940’s. But we are not sure if it really is a Barris Custom. Hopefully one day we will know more details about the car, the owners name, and who restyled it. 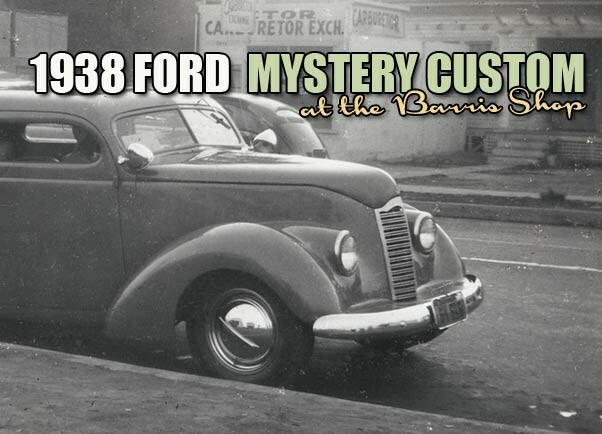 Hopefully this CCC-Article will help find more info on this mystery 1938 Ford Custom. This is the second photo of the Restyled sedan. Sadly we only have a a poor scan of this, however it gives us a lot of extra information about the car. The car is either a 1937 Ford Sedan, or a 1938 Standard Sedan model. Both year cars used basically the same body and fender styles. The regular 1938 Ford used more rounded fenders. It also appears to be a humpback sedan. The top has been chopped pretty heavy with the A and C-pillars left at the stock angle, which means the top had to be extended to make it fit after the chop. The drip rails have been removed, which was very popular in the 1940’s and early 1950’s. And it looks really great on this car making the body look very smooth. It appears that the door top corners have been rounded. The running boards have been removed, again a very popular restyling trick from the early years. Below the body a new panel was created to cover the frame. This new panel has a wonderful roll on the bottom giving the new lower edge of the car a very finished look. The front and rear fenders were reshaped at the bottom where once the running boards fitted. The fenders are molded to the body and at tee rear a tear drop shaped skirt was added. The door handles and all other chrome was removed for an ultra clean look. I cropped the original photo to get a better look at this well restyled Custom Sedan. It also shows that across the street there is another full custom chopped sedan parked. 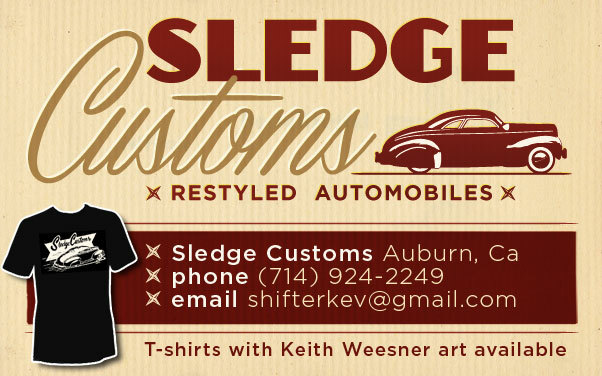 It looks to be a 1941-48 Ford sedan with a chopped top and reduces rear window! At the front of the car the grill was replaced with a Packard clipper unit. The front of the hood was reshaped to meet with the new lower grille. The hood sides were smoothed, or most likely replaced with new hand shaped units. In the photo we can see that there is a gap from the cowl to the hood sides, indicating the hood sides are separate units. But at the front we can not see any lines. Perhaps the whole front unit was welded solid, fenders, grille and hood sides, and this unit could possibly be removed if engine work required it. The headlights buckets were modified with round headlights for a more modern look. A hand made splash pan was created to mate the 1946-48 Chevy front bumper to the car. The bumper was mounted rather high on the body. This was a common trick done to lowered customs back in the 1940’s The raised front bumper made the car look higher from the front, so if a cop would see you from the other lane, he most likely would pass the car not thinking it was too low… and in need for a too low ticket. The bumper at the back looks to be the same year Chevy unit as the front. Both bumpers are taller than the original Ford units and wrap around the body really nice, giving the car a very nice look. A set of Appleton spotlights and the popular single bar flipper hubcaps with beauty rings were mandatory for any custom from this era. The black wall tires are typical for these type of customs created shortly after WWII. The white wall tires were available, but hard to get, and much more expensive than the regular black wall tires. What happened to this great looking Custom Car after these two photos were taken? Who was the owner,and who was the builder? Was this really an Barris Customs Restyled Sedan as we think it is? As far as I know this car has never been published in any of the magazine/books back in the day. Dan Post used a lot of photos of not so well known restyled cars in his publications, but even his books do not show this car. If you have any more information on this great looking fully restyled Sedan, please Email Rik, we would love to share the whole story here. Wow, this is like a time capsule, a glimpse back into that early post-War period. A perfect picture of trends tracing back to Westergard’s influences from northern California, and early Barris work once they moved south. Memo was showing me how those frenched headlight forms, ala early Chevy cars and pickups of the 40s, could create a smooth, low placement which, in turn highlighted a tall grille such as this classic Packard unit. It also gives us pause to compare that period with later styles and shapes given those sedans. 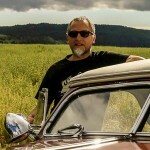 I’m with Rik, there’s a certain charm to these smooth early forms of the rapidly changing world of the custom car. Takes me back to the thrill I felt as an 8 year old kid, seeing a low, skirted custom glide by, with that speedboat stance, and flippers hgypnotizing in the way they played with the sunlight. Precious memories recalled. Thanks, Rik! Nice job on the article, Rik! I love this one too, and I hope you can find out some more information. Keep up the good work!